5 Bedroom Detached House For Sale in Sevenoaks for Guide Price £820,000. An imposing and attractive Grade II Listed Manor House, believed to be built in 1595 and once owned by the Archbishop of Canterbury. 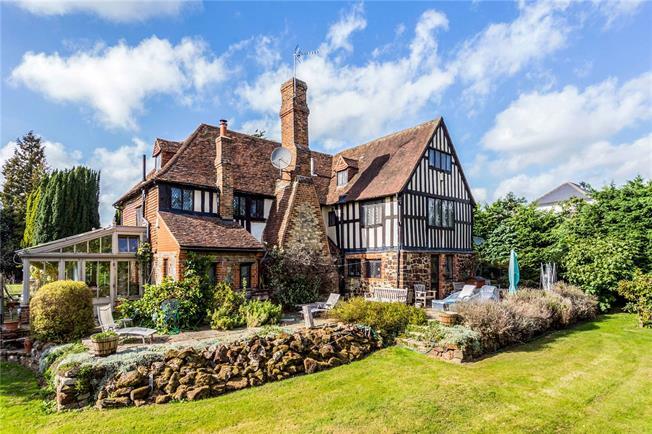 This wonderful Elizabethan country house is full of the character of this period and has been listed for its special architectural and historic interest. The house is conveniently located for Borough Green & Wrotham station and local amenities (0.1 miles), yet is tucked away and set back from the road. Internally the house benefits from spacious rooms with surprisingly high ceilings and it has a practical layout for family living. The house sits in the centre of a well established secluded garden, which extends to 0.69 of an acre. The house offers a new owner an opportunity to modernise the house to suit their own taste and requirements. The accommodation is set over three levels, plus a cellar, and extends to over 3,500 square feet. Character is prominent throughout the house with floor and ceiling beams and period fireplaces. The original timber front door opens into a useful porch area which in turn leads to a generous entrance hall with a fabulous inglenook fireplace with a wood burning stove and original beams. Stairs lead from the ground floor to the first floor landing, and there is an under-stairs storage cupboard which houses the fuse board. To the right of the entrance hall is a traditional style heated conservatory, which was added by the current owner and is a splendid sunny room with a tiled floor and a pretty view of the garden and doors at the front and back allowing access to both gardens. There is a productive grape vine growing in the conservatory for those who may be interested in making their own wine, and a cellar for storing it! The generous living space also includes a spacious sitting room that overlooks the front garden and features an attractive fireplace with wood burning stove, and a 19ft dining room that has a window seat overlooking the front garden as well as an inglenook fireplace with a working open fire. The triple aspect kitchen, at the back of the house, was an extension apparently added in the 1930s. This is fitted with a range of wooden wall and base units with a worktop over and built-in breakfast table, and benefits from views of the garden and a door leading outside. A shower room with a power shower is accessed off the main entrance hall and completes the ground floor accommodation. A second staircase from the inner hallway leads to the first floor landing, providing access to three double bedrooms. The back bedroom has triple aspect views of the garden and the bedroom to the front has built-in wardrobes. Another large double bedroom is currently set up as a reception room but this would make an impressive master suite as it has a large en-suite bathroom. A door from this room leads to another landing with stairs down to the main entrance hall. The second floor is accessed from the main first floor landing and here there are three further rooms, currently set up as two bedrooms and a kitchen. One bedroom has an en-suite bathroom and there is an additional shower room. This wonderful house is located in Borough Green, which has array of local shops and a mainline station offering direct services to London Victoria (48 minutes), London Blackfriars (52 minutes), Maidstone (20 minutes) and Ashford International (50 minutes). The amenities and shops of the market towns of West Malling and Sevenoaks are approximately five and seven miles away respectively. Sevenoaks station is on the Charing line to London. There is access from Borough Green onto the M20 at Wrotham Heath and M26/M25 motorways. The property is screened from the road by a high brick wall, behind which is a driveway providing off road parking for multiple vehicles. There is a double garage and workshop which extends to 685 square feet, and over 50 ft. in length. This could be used for various purposes and offers potential for a separate annexe subject to planning, listed building consent and a buyer’s own investigations. An attractive yew tree hedge separates the driveway from the garden and house, a wrought iron gate with brick pillars either side opens into the mature front garden, where an impressive yew tree lined path leads to the front door. The garden, which extends to 0.69 of an acre is a wonderful feature of the property and has a number of fruit and nut trees including apple and pear trees, Kent and Victoria plum trees, a Medlar tree, a fig tree and a Kentish cob nut tree. The paved terrace running adjacent to the back of the house offers the perfect entertaining space, with steps down to a flat lawn. The garden borders and rockery are well stocked with a variety of mature shrubs and plants creating a colourful backdrop year round. Privacy is assured by tall surrounding hedges mainly of laurel. The garden also benefits from an oak gazebo, which provides a useful sheltered outdoor dining space.